Memorial Monument to Octavius V. Catto, a prominent African American intellectual, scholar, teacher, athlete, Civil War veteran and civil rights leader who was slain on Election Day in 1871. In recognition of the many contributions of Philadelphia’s own Octavius V. Catto, a prominent African-American intellectual, scholar, teacher, athlete, Civil War veteran and civil rights leader who was slain on Election Day in 1871, Mayor Kenney joined the Octavius V. Catto Memorial Fund co-chairs Carol Lawrence and James Straw and other dignitaries at the unveiling of the Octavius V. Catto Memorial — “A Quest for Parity” – on Tuesday, September 26, 2017 at 11 AM. The memorial sculpture — the first statue in the city’s collection dedicated to a sole African-American — is erected on the southwest apron of City Hall. In addition to erecting the memorial monument to Octavius V. Catto, the long-range goal of the Octavius V. Catto Memorial Fund is to educate the public about Catto’s life and accomplishments, as well as highlight the contributions of other African-Americans throughout Philadelphia’s history by creating educational programs aiming at broadening the public’s understanding and awareness of African-American history. Born in 1839, Octavius Valentine Catto was a major in the Union Army during the Civil War, as well as a scholar, educator, athlete and member of the Union League, The Library Company of Philadelphia and The Franklin Institute. He was a prominent civil rights leader who fought for the right to vote for all men regardless of ethnicity [women were not allowed to vote at this time] and successfully led efforts to integrate street cars in Philadelphia in 1867. He was gunned down on Election Day — October 10, 1871 — at the age of 32 while on his way to the polls to serve in his official capacity as a National Guardsman assigned to protect newly registered African-American voters. 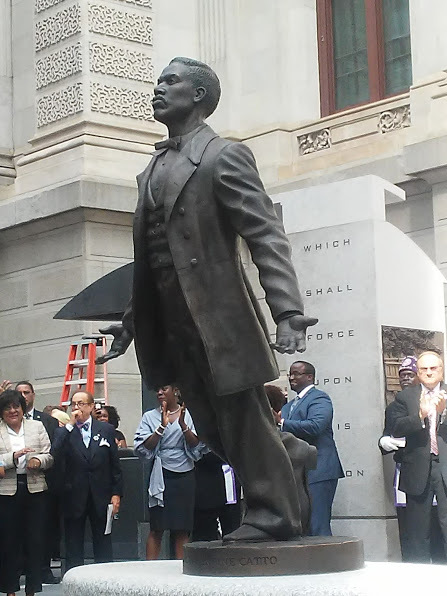 The memorial sculpture to Octavius V. Catto is a groundbreaking art installation in that it is the first statue of an African-American on public land in the city of Philadelphia. Renowned sculptor Branly Cadet created the work.